Dragonkin are bequeathed greed and ambition, but lack the power to claim it. For evey fiery breath weapon, there is an obvious scale or horn that marks a half-dragon as an outsider. For every natural immunity or fearsome ability, there is an overwhelming ego that leads to quixotic and sometimes deadly quests. And no matter what they do, dragonkin can't escape one ever-present fact: they are the spawn of dragons, but they live in the world of man. The Complete Guide to Dragonkin examines these half-bloods in all their forms, from those spawned by polymorphed dragons to the mutant creatures produced by arcane egg-sculpting. * Rules for playing dragonkin as player characters and monsters, including new feats and racial templates from the diluted dragontouched to the consummate half-dragon. * Four new prestige classes for dragonkin: the phlebotomist, primal beastman, whiplord, and wyrm-dedicate. * Rules for ancient dragons that ascend to the power of gods, and the dragonkin who worship them. * New rules for draconic magic, egg-sculpting, dragonkin monsters, and more! 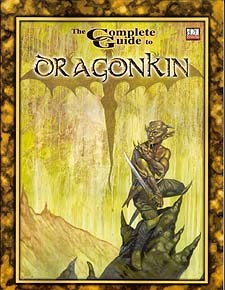 The complete Guide to Dragonkin is 100% stand-alone and world-neutral. It can be integrated easily with any fantasy setting. Requires the use of the Dungeons and Dragons Player's Handbook. This product utilizes updated material from the v.3.5 revision.